21st century power — In yet another Lightspeed first, Tango is the first aviation headset powered by rechargeable lithium ion batteries, a power source trusted in countless critical applications. Lightspeed's rechargeable lithium ion batteries deliver twelve hours of continuous operation while offering earth and wallet friendly reusability in a compact size. The Tango dual-port wall charger can quickly charge both the headset and panel interface batteries at the same time, providing 75% charge in less than an hour and a full charge in two hours. The batteries can also be charged while the headset is in use or easily replaced on the go. The battery for the headset and panel interface are interchangeable, and spare batteries can be purchased separately. Auto Shutoff — Lightspeed's proprietary Auto Shutoff feature saves battery life by automatically shutting down the headset and Panel Interface power when not in use. Are you a FAA Certified Flight Instructor (CFI) or a Professional Pilot? If so, you can qualify for a $100 rebate on the Lightspeed Tango by providing either a copy of your CFI certificate and a copy of your most current logbook page showing instructional flights or a copy of your ATPL/CPL indicating ATP or commercial pilot certification and a proof of current employment as a professional pilot. Chat, email, or call us at 877-314-7575 for full details. 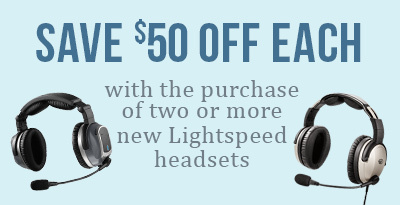 Trade in your old, working, headset for credit towards the purchase of the Lightspeed Tango headset! What's included with your Lightspeed Tango Wireless Headset? Choose your plug type: Dual GA battery power (rechargeable lithium ion); LEMO panel power*; or U-174 Helicopter battery power (rechargeable lithium ion). *Panel power is only provided to the panel interface. 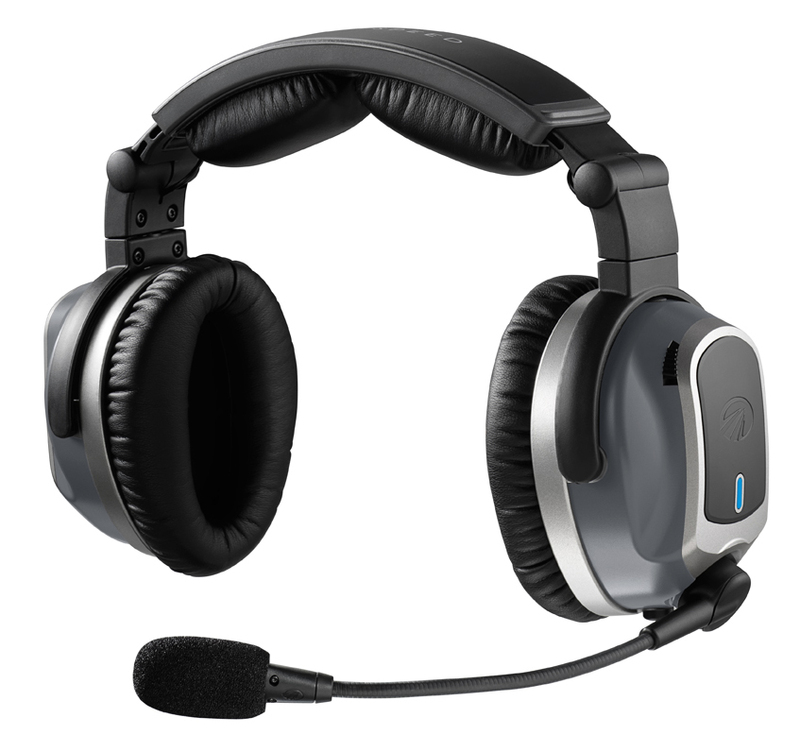 The headset still requires a rechargeable lithium ion battery (included). Review: Really enjoy this headset, it is comfy, lightweight and sounds great. Cheaper than the Bose A20 and without the wires. I will say to keep it charged though, It lasts quite awhile between charges but it died on a flight 3 miles out from my downwind entry and caught me off guard, it was easy to plug in the direct line adapter but I could not hear myself speak and didn't know what to think. I ended up plugging in my backup set and after landing it only took about 30 min to give me plenty of charge to fly back home. Blue tooth works great, making phone calls is easy and my recipients can't tell that I am flying... they say the phone quality sounds great. Definitely a must have headset in my book. I love not having the wires but with that said it has to be charged every time. I had a problem at first making it work with my intercom. Do read the instruction first. Review: As far as 'aircraft noise reduction' goes, this headset does a great job. At this price, I would expect it to. As far as comfort and fit: compared to the Bose A20, at least the Lightspeed Tango stayed put on my head and wasn't constantly sliding back and forth in flight. Unfortunately, for those of us who wear glasses, even with very thin frames, the warbling, rumbling sounds occurring with ANY head movement is very annoying. I understand that this is a result of a 'less than perfect' seal of the muff around the ear. Other than switching to contact lenses, not sure how you can correct this issue. While the concept of 'wireless' is very appealing, it is not as convenient as I envisioned. Had some placement issues with the control unit in several aircraft. Actually, when mounted in the side pocket on a 172S, I guess I inadvertently turned the unit off with my left leg. Didn't try unwinding the 'emergency' cord from control unit and connecting it to the headset while in flight. The battery door, which needs to be opened, and remain open, to charge the headset, looks and feels flimsy. Not sure how long it will last in a normal environment. Package also contains an AC charging unit, two USB charging cords, two battery packs, a mounting clip, and color coded frequency tabs. Just too many parts to keep track of for this old pilot! Review: Just what I expected. Top quality. Review: I have a few friends who have various Bose headsets, a few David Clark's, and I must say this set outdoes them all. Only issue is with very old radios you need to hard wire the set in and lose the ANC. Pros: Works well and as advertised. Very convenient to use. Review: I am a CFI and fly/teach in several different airplanes, so leaving a headset in the plane was not an option. The Bose I was using was getting beat up putting it in and taking it out of the plane on every flight. I love the fact that there are no wires and it is easy to hook up and remove the heasdet. The ANR is effective and the quality of the quality of the audio is great. The bluetooth is great for getting clearances at airports without a tower or remote comm capability. Being a longtime fan of Lightspeed the Zulu, when I saw the ad for Lightspeed Tango on Friday, Nov 13th, I thought it was my lucky day. While I have owned many headsets and flown with most of the major brands, when I first tried the Zulu in 2008 I was won over and have been flying with a Zulu nearly every flight hour since. While I typically shy away from the first generation of new technology, the thought of going cordless caused a brief lapse of sanity and I took the plunge. The headset arrived Monday. Taking them out of the box, at first glance it looks like the Tango borrow in fit and style from the Lightspeed Sierra. While the Zulu has a metal headband and ear cups, the Tango has plastic and look similar to the Sierra. The proprietary 3.7v 1150mAh 4.3w lithium ion batteries look similar to other batteries of this type so nothing unusual there. One battery is for the headset, one is for the panel interface. They are interchangeable and note that you will now have two units to turn on and off. While I have concerns about the longevity of the ingenious battery cover, set up was easy and the batteries seem to have come nearly fully charged. You can read the tech reviews online so I will mostly forgo already known information, however note that the battery cover needs to be opened to charge the headset via the included mini USB cables using the 100-240 input 5v 2.4amp DC output wall charger. That will be a daily occurrence for many pilots. Coincidentally there is a cut out in the battery box cover over the mini USB port, however the cutout is covered by the plastic trim on the top of the cover. One could imagine cutting a small portion of the trim away to expose the port, slightly degrading the exterior looks but making opening the cover each time to charge the headset unnecessary. The roughly 8x2x1.5 panel interface contains the second battery, interface and back up cables, other features and an exposed mini usb port for charging. With just a few exceptions, like a battery change, you should not need to open up this unit. The headset Bluetooth sync?d to both my iPhone 3GS and iPad 2 mini quickly and I was off and running for a non-flying test of going wireless. Phone calls over the headphones worked as expected, however as noted in the included information manual, you will need to keep the phone and the interface in close proximity when using Bluetooth. As far as headset range, I tested the headset/ panel wireless connection around a 2200 sq foot two story house with degradation in connection only at the extreme ends of the house. Assuming I will be always within a few feet of the interface while flying, I do not anticipate any problems. The only side by side comparison I can give is to my original Lightspeed Zulu so here it goes. From a weight standpoint, holding my Zulus in one and hand the Tangos in the other, the weight difference was not distinguishable. Putting them on our zeroed but un-calibrated analog postage scale, I measured the following: the Tangos were 17.5 oz, the Zulu?s 14 oz with the headset only, but 20oz with battery box, cables and 2 AA batteries installed. I have flown some very long days with Zulu headsets and greatly appreciate the comfort, the Tango feels very comfortable as well, however I will follow up with a report in a few months after a few long cross countries. Music ? While not the main reason for purchasing an expensive aviation headset, I have spent many hours listening to music with the Bluetooth feature of the Zulu. With this in mind I completed a side by side test with my original Zulu and the Tango. With the Zulu?s sync?d to an iPhone 3GS and the Tango?s Sync?d to an iPad 2 mini, a side by side comparison test of Vivaldi?s Violin Concerto in E Op 8/1 RV 269, Linger by the Cranberries, Now that I?ve Found You by Alison Krause, and Hero by Skillet, revealed a nearly indistinguishable sound quality, in spite of the Zulu?s having bass boost and other music settings. Both gave a beautifully rich robust sound that I really enjoy. If you have trouble with the auto off function cutting short your music playtime, note the manual tells you how to turn off this function. After a couple of hours of use it took less than 30 minutes to bring both the batteries back to a full charge. I tried a longer test, leaving the interface on overnight (approximately 8.5 hours) and it took the advertised 2 hours to fully charge it again. My first flight with the Tango was 1.5 hours in a 1999 Cessna 172S, I have subsequently added another 1.4 hours. The module plugs into the headset jacks and tucks neatly into the side pocket. Once the power button is pushed on both the module and the headset you are up and running. One thing to note, how you hear your voice over the intercom in the headset is different on a wireless vs. a wired headset. I contacted Lightspeed concerned about the difference and they gave me some pointers on adjusting volume and mike gain to help optimize the clarity and confirmed this different sound is normal. As far as ear seals over glasses, I fly with sunglasses and the Tango?s still fit great. The ANR function was equally as good as the Zulu and after a few minutes you forget there is anything unique about the Tango, they just fit great and work well. After 45 minutes of flight I tested the backup cable. The backup cable consists of a 1/8 jack coiled into the interface module and ready for quick connection. I easily accomplished this without taking the headset off. Once plugged in, the backup cable disables the ANR function and you are back to wired passive noise cancelling headset. I found the passive noise cancelling of the Tango superior to the passive cancelling of my Zulu?s and flew for 10 minutes or so without ANR quite comfortably. Understanding that the ear seals on the Tango are new and my Zulu?s have never had the ear seals replaced, the difference in wear may account for the difference in noise reduction but I am not certain. Overall the Tango?s are comfortable and seamless in their interface. I think they are a great headset for someone looking to eliminate some wiring from the cockpit. If you fly aerobatics or float planes where headset cords could impede egress, I highly recommend switching to the Tango. Cons: has to be charged. I did leave the headsets in the airplane but with the Tango both the headset and sending unit have batterys that need recharging. Was this review helpful to you? Yes No 66 Other people found this review helpful. Q: Do you take trade ins on your new tango headset? A: Yes, we do! Just fill out the trade in form and we will be in touch! Replacement Memory Foam Ear Seals for LightSPEED Zulu, Zulu.2, Zulu PFX, Sierra and Tango Headsets. Replacement Head Pad for LightSPEED Zulu Headsets.